These are total acres from both the East Montpelier and Craftsbury Farm. We are constantly looking for ways that we can improve our field management practices to improve our efficiency, reduce our costs, improve our yields while at the same time optimizing our resources and protecting our environment. In 2008 we started the transition to a no-till cropping system, we have successfully completed the transition and now plant all of our crops using no-till techniques. Changes moving forward will be experimenting with diversified cover crops for double cropping to improve soil health and ultimately improve yields. No-till farming is a way of growing crops from year to year without disturbing the soil through tillage. No-till will aid in moisture retention, reduce erosion, increase soil health and living organisms in the soil, plus it will greatly aid in the retention of nutrients. Corn is planted no-till directly into the winter rye cover crop. Close up of our no-till corn planter. "No-Till farming is an excellent way to get more annual crops in your crop rotation because it reduces soil erosion greatly." Sandra Primard, USDA-NRCS Agronomist. 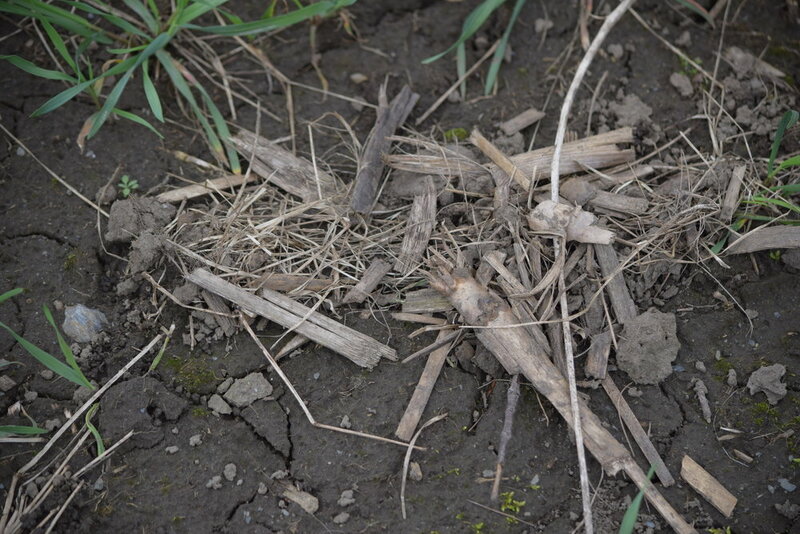 The two images shown below capture results from our no-till and cover crop system. An example of excellent worm activity, the worms have begun to breakdown this corn stalk. This picture was taken in the spring right before corn planting, worm activity is a great indicator of good soil health.